*HANGYO INTERNATION CORP. 한교아이씨에 오신것을 환영합니다. 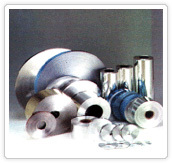 Aluminium business field supplies aluminium products in various cope such as condenser foil, optical cable, wire covering material, and flexible packaging materials used in monitor and microwave as well as air conditioning and heating FIN material used in automobile air-conditioner and refrigerator as a leading company provided with accumulated technology and forefront facilities. Aluminium is used as a material for electricity and electron products. We are always trying to satisfy our customers' wishes. Aluminium Housewares is made more conveniently to living as Aluminium itself is harmless to the human body and soft. There are cooking foil, gas mat, luncheon box, baking, plate etc. as our products. for air conditioner radiator and car air conditioner.